Frost forms in much the same way as dew forms. Frost usually forms when a surface cools through loss of infrared radiation to a temperature which is colder than the dewpoint of the air next to the surface, AND the temperature of that surface is below freezing (32 deg F, or 0 deg. C). The source of this moisture is water vapor contained in the air. The heaviest coatings of frost usually do not occur at the coldest temperatures because very cold air can not hold very much water vapor. Instead, thick deposits of frost usually occur when the air temperature is close to 32 deg. F (0 deg. C). 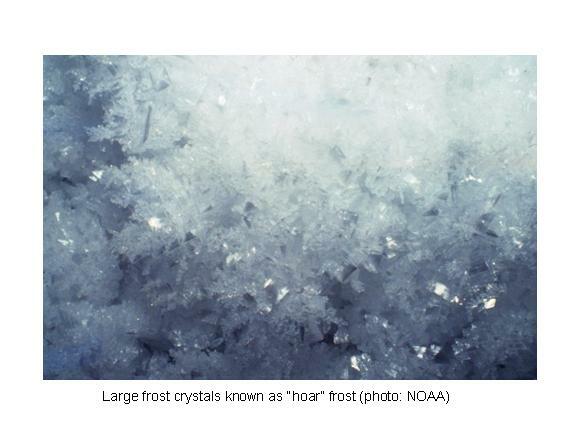 HOAR FROST: Huge ice crystals of frost (see the above photo) can develop if a cold surface below 32 degree F (0 deg, C) is exposed for a long period of time to unusually humid air. This can happen on the underside of ice covering a river if the water level of the river falls after the ice was formed. The relatively humid layer of air trapped between the surface of the river and the underside of the ice then acts as a continuous source of moisture for the frost to grow on the underside of the ice. Hoar frost is also found in some layered snowpacks.